My name is Jeroen Stoop and I'm 31 years old living in Amsterdam. One of my passions is to shoot movies with my Canon 60D dslr camera. You can check out some of my work through my Vimeo account. Two areas I'm specialized in are motion graphics and motion pictures. I like the technical aspect of my job and continue to learn new and innovate ways to capture motion pictures. I studied Communication, Multimedia and Design in Leeuwarden. 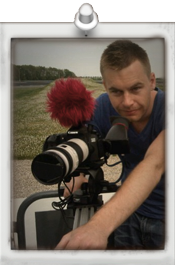 At the moment I work for MTNL as a cameraman, we produce programs for dutch television. Futhermore I worked as cameraman for Fashionscene tv shown on Net5. I'm also active as a freelance cameraman for a lot of event registrations and corporate movies for brands like Red Bull, Vodafone, Boomerang and Björn Borg. The last few years have presented many opportunities and challenges where I have filmed, edited and did motion graphics for various events like: Q-dance, Sensation, Extrema, Amsterdam Dance Event, Concert at sea, Lowlands, Radio2 Vrienden Van Amstel, Lowlands, Serious Request (Het glazen huis), 3FM Met Michiel Serious Talent, The 3FM Awards, State Awards and the Dutch Fashion Awards. Furthermore I produced corporate movies for brands like Heineken, KPN and Buma Cultuur. DSLR Canon 7D and 60D. Sony HVR-V1E HVR-Z1, HVR-Z5 and EX3. experience with editing in Final Cut. Motion Graphics using After Effects. I provide all kinds of motion graphics for many different purposes. If the movies stutter or you browse on a mobile phone please click here to view the Quicktime version of this site. Stevens Bikes Testing road bikes in a wind tunnel to prepare for the Olympics 2012. I filmed. Starwars DVD package Text and win commercial. © Copyright 2011 Ishootyou.nl All Rights Reserved.